Stop Talking... Get It Done! The Leaders Guide to Bringing Vision and Action Together is a book about making your dreams a reality. 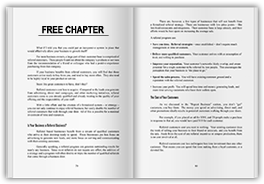 It describes how entrepreneurs and small business owners can create their vision and take the next simple step to making it a reality. Since engaging Vision Cast Canada as our Business Coach we have moved our business in an entirely new direction, one with focus, clarity and of course, vision! I’ve benefited from strategic and intelligent direction implemented through consistent and measurable changes that in turn, has resulted in achieved objectives. It has been motivating to say the least, and being able to share in confidence my struggles and milestones with Tyler, has been invaluable to our growth both as a business, and mine personally as the Founder of the company. I wholeheartedly recommend Vision Cast to anyone seeking guidance on their business’ vision. I have always passionately believed in the importance of clearly articulating vision, it is something that should be constantly in front of us as an anchor and a reminder of why we do what we do. However in the chaos of life is too easy to get immersed in the day to day and to lose clarity. Vision Cast are here not only to help us articulate that vision, but to constantly bring us back to that vision with practical steps to keep us on track. Thanks!